I (still) can't help but feel helplessly attracted to anything shimmery. 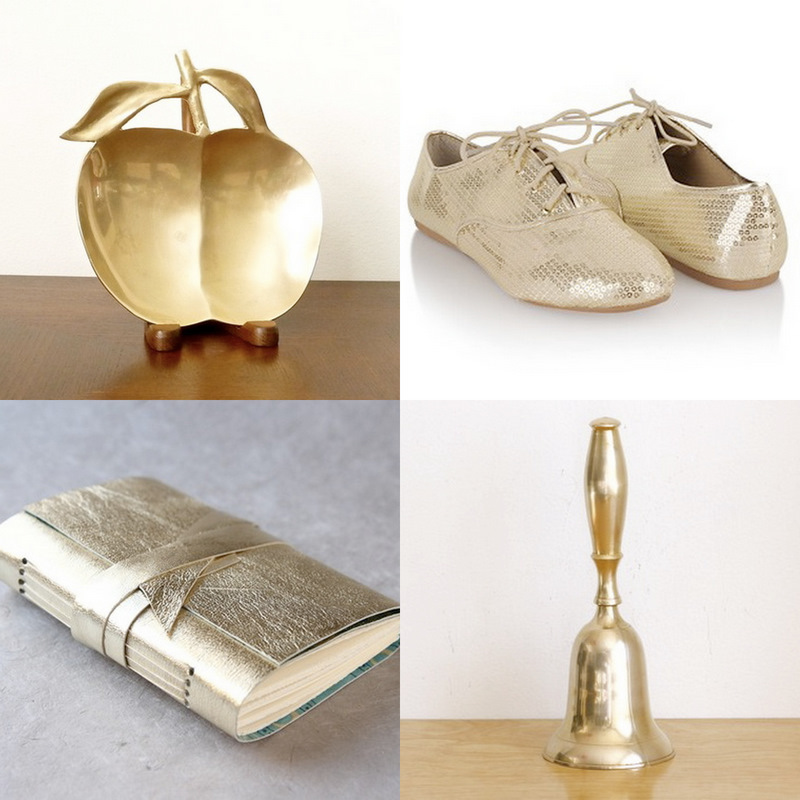 Whether it's a quirky apple dish to hold my rings, a pair of sparkly oxfords to impress my budding fashionista students, a dainty vintage brass bell to signal the start of dinner or a gold lambskin leather journal to record story ideas, I'm smitten. I have to admit...I'm a sucker for gold-even in brass form. Love that apple! I really want those sparkly shoes! Those sparkly shoes are top of the list!! I can't imagine possibly being in a bad mood while wearing those beauties. such great finds. i'd imagine that sparkly shoes can turn anyone's day into a great one! i mean, how can anyone be upset when wearing those?! want want. Anything glittery and sparkly and I'm all over it! Love that bell... it's beautiful. That dinner bell-what an elegant way to announce that supper's ready! I'm a sucker for shimmery, too! My love of sparkly is getting worse, I've got to tone it down a little. I'm such a girl. all shoes should be sparkly. the end. I need more sparkly shoes. Oxfords I've discovered aren't quite me, but I adore seeing them on other women. The journal...now that I would fill with dreams. I love those sparkly oxfords! great find!